Modern kitchens have been all-white for what feels like centuries. Quartz countertops, white Ikea cabinetry, subway tile ... frankly, the look is getting a little tired. Sure, there's a lot to love about the pristine, airy look — but there's plenty to dislike, too (like the number of hours spent cleaning). The solution: dark wood kitchen cabinets — ranging from rich, natural wood finishes to dramatic shades of paint. The end result will feel refreshingly modern, and the change can add surprising depth to a simple kitchen remodel. Here are 13 reasons why you should take the plunge into moody kitchen cabinets. 1. Black cabinets add dramatic flair. Swayed by the recent black wall trend? Try matching smoky cabinets with white walls. 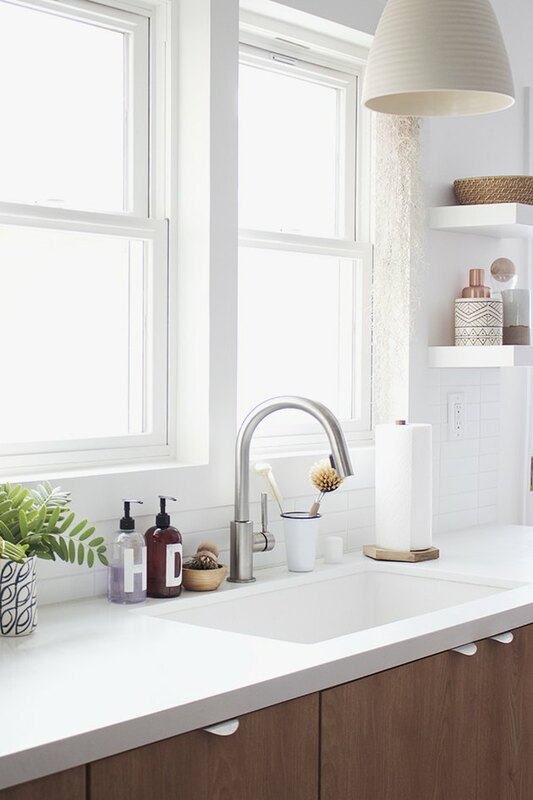 The combo works best when your kitchen's blessed with sunlight — and the finished look is oh-so-chic. 2. Dark cabinets anchor spaces with high ceilings. 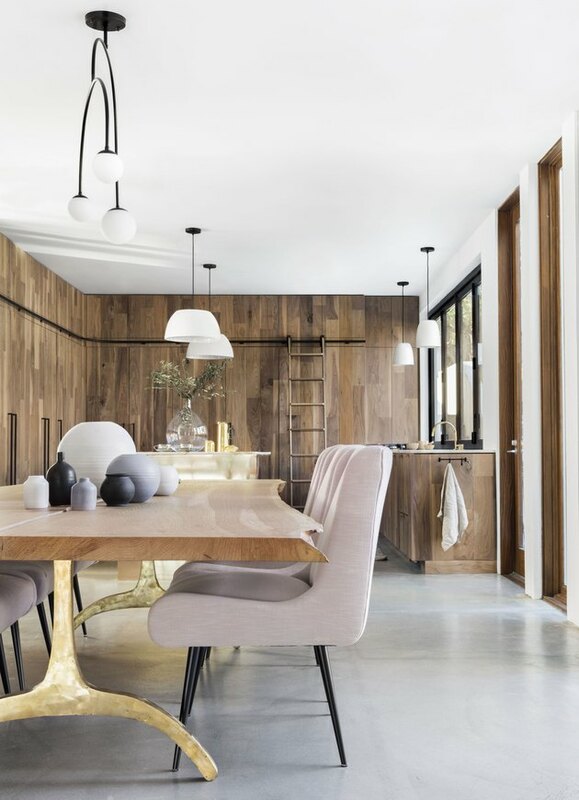 Designed by Raili Clasen, this beach-house-meets-modern-farmhouse is a sight for sore eyes. 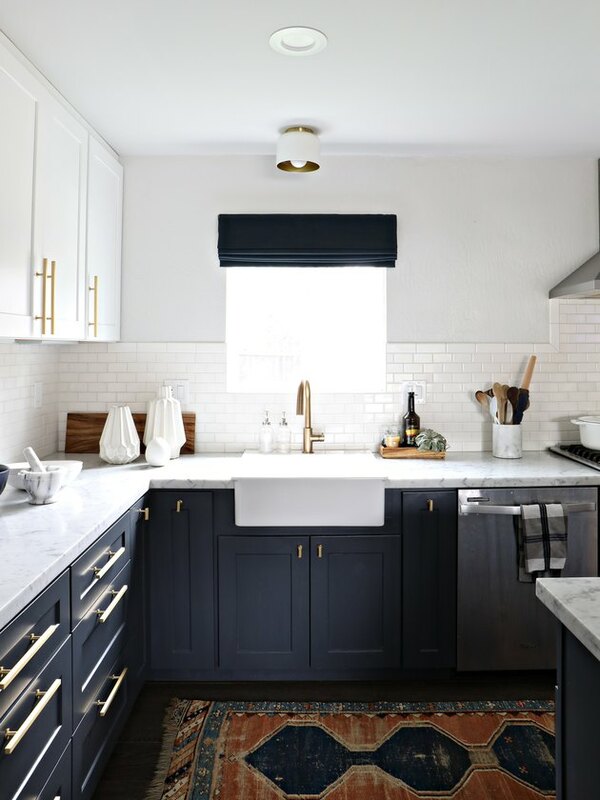 A simple white kitchen is transformed into a modern masterpiece thanks to the combination of bold navy blue cabinets, brass fixtures, and rustic details. The white waterfall countertop island doesn't hurt either. 3. Kitchen islands make the perfect dark cabinet trial. Tempted by the dark cabinet look but uncertain if you're ready to put it everywhere? Update your kitchen island first. 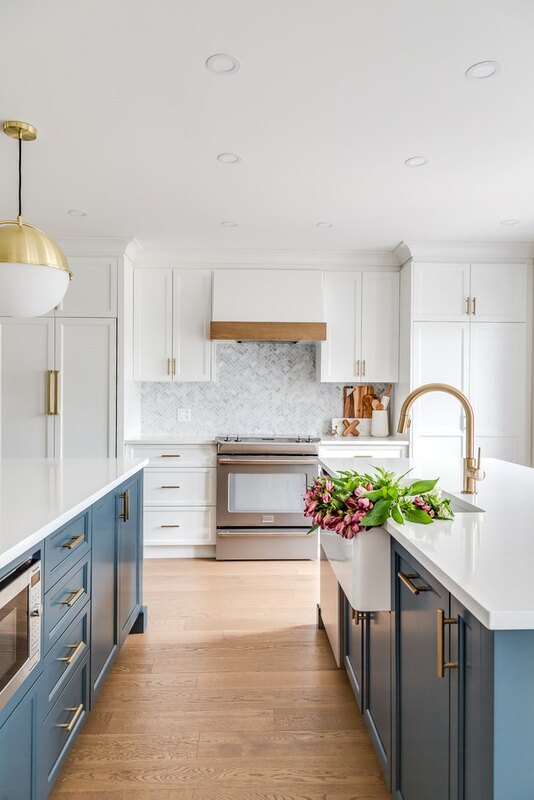 The blue-gray shade of this kitchen island created by Hibou Design Co. accents the trendy (almost) all-white kitchen gorgeously. 4. You can't go wrong with natural wood finish. 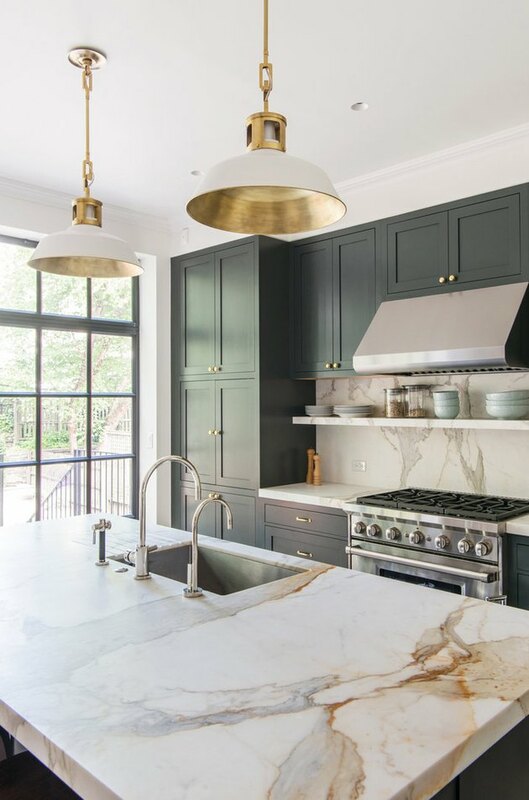 Floor-to-ceiling millwork is a luxe look no matter what color your cabinets are — but done in a dark natural wood finish like the kitchen of Emily Henderson's best friend, the effect is totally glam. 5. 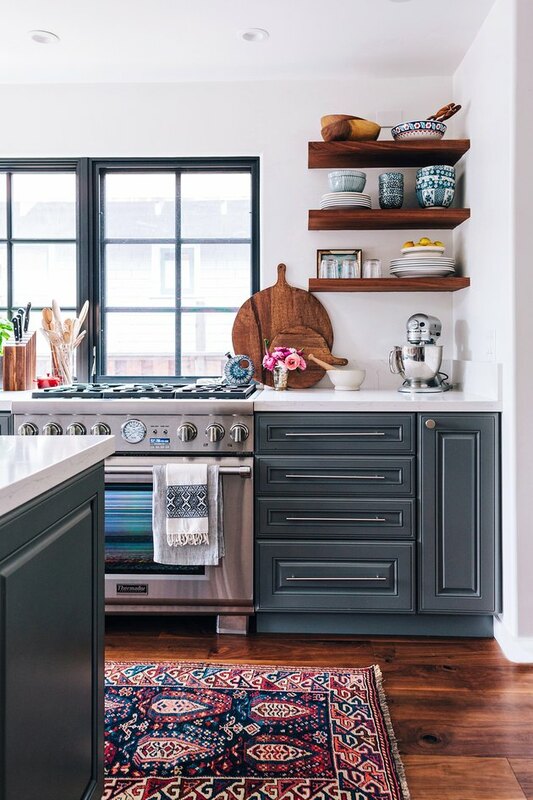 Dark cabinets work well in a farmhouse kitchen. If you adore the modern farmhouse look, then you're going to love this kitchen designed by Jean Stoffer. 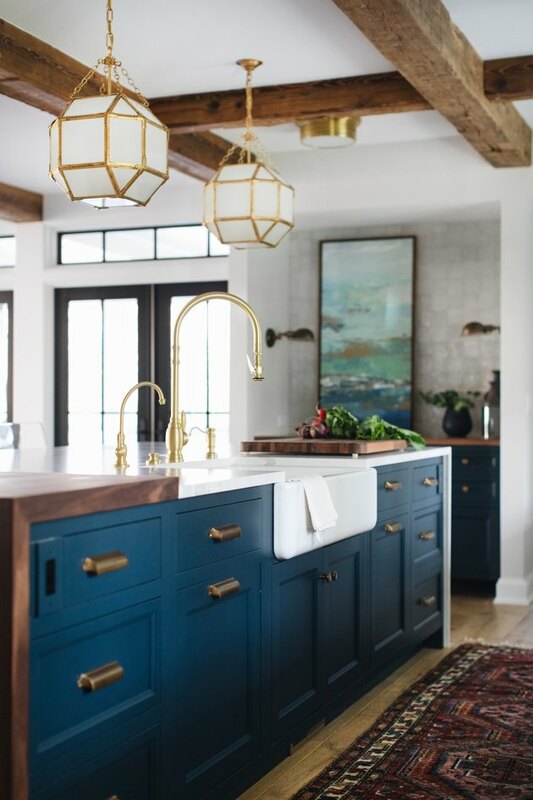 In this culinary space she pairs brass fixtures and rustic details with sleek navy blue cabinets to give the room an edge without losing any of its country charm. 6. Dark hues give older cabinets a fresh, updated look. Replacing dated cabinets can be expensive — it's much cheaper to paint them. Aniko from Place of My Taste gave her existing Ikea cabinetry in a wood finish a fresh coat of paint to refresh her kitchen's look. 7. Stainless steel is the perfect partner for dark cabinets. Try something totally modern when you redo your kitchen: Pair dark cabinetry and a beautiful rug with stainless steel accents and appliances. Erica from Honestly WTF's kitchen is sophisticated and refreshing — a Pinterest-worthy example. 8. Stone countertops look ten times better with dark cabinets. Sure, gorgeous stone countertops look great no matter which cabinetry they're paired with. But there's something about darker millwork that accentuates the look. Don't take our word for it, just look at this kitchen designed by Elizabeth Roberts. 9. 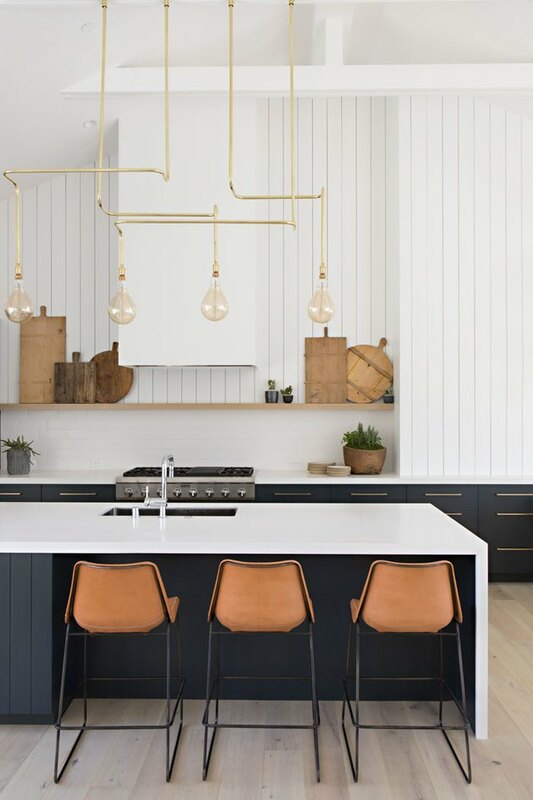 Light spaces feel balanced with dark cabinets. Say you do love that all-white look — but you want the kitchen to feel balanced. 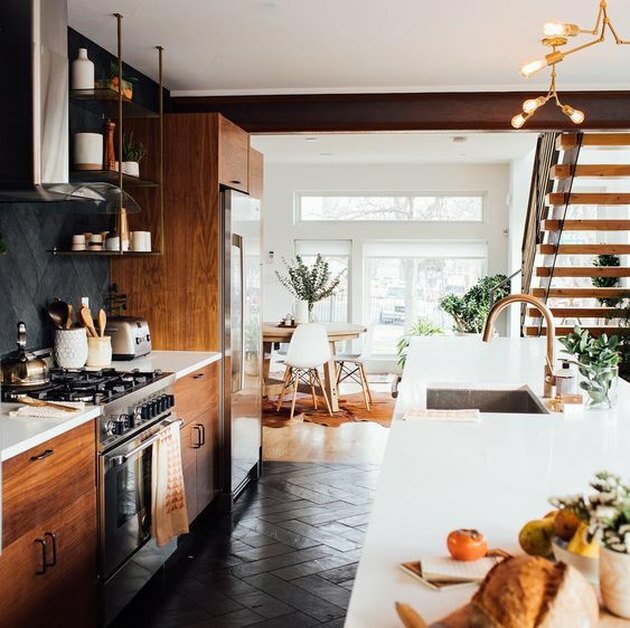 Try dark wood kitchen cabinets on the bottom and white open shelving up top, like in this expansive, sun-filled kitchen belonging to Molly from Almost Makes Perfect. 10. Dark wood cabinets offer a warm and cozy vibe. Classic doesn't have to mean stodgy, boring, or basic. 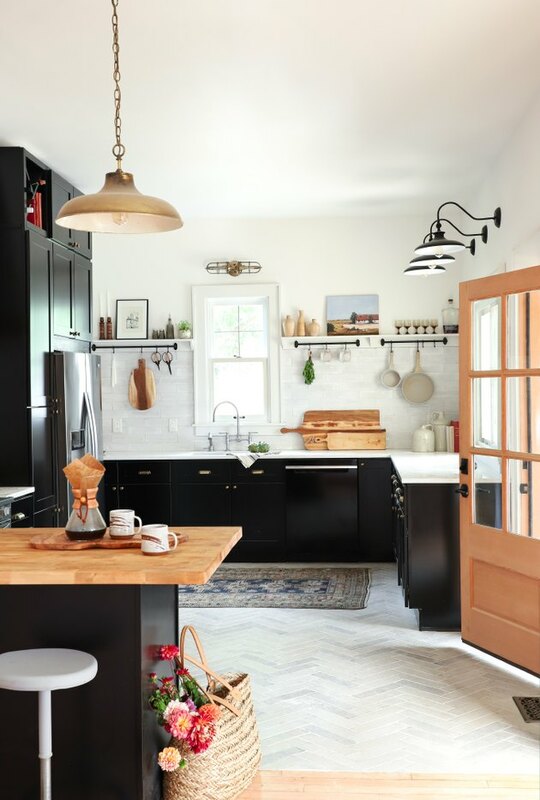 Dark, rich wood cabinets like the ones in this kitchen designed by Layne Kula invokes a warm and cozy vibe. 11. Dark cabinets complement your kitchen rug. 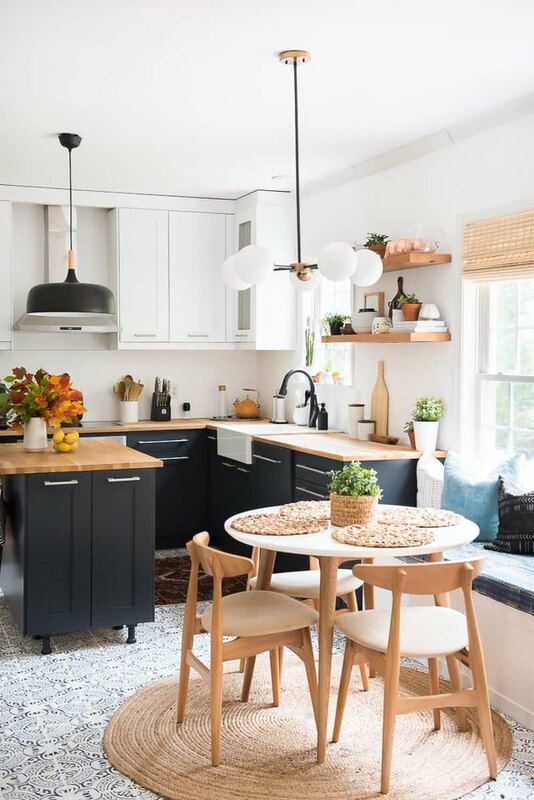 Follow Brittany's lead from The Vintage Rug Shop, and coordinate the look of your dark cabinets with your kitchen rug. 12. Dark cabinets are a new spin on modern. We dare you to give your cabinets a modern matte makeover and pair them with elegant accents. 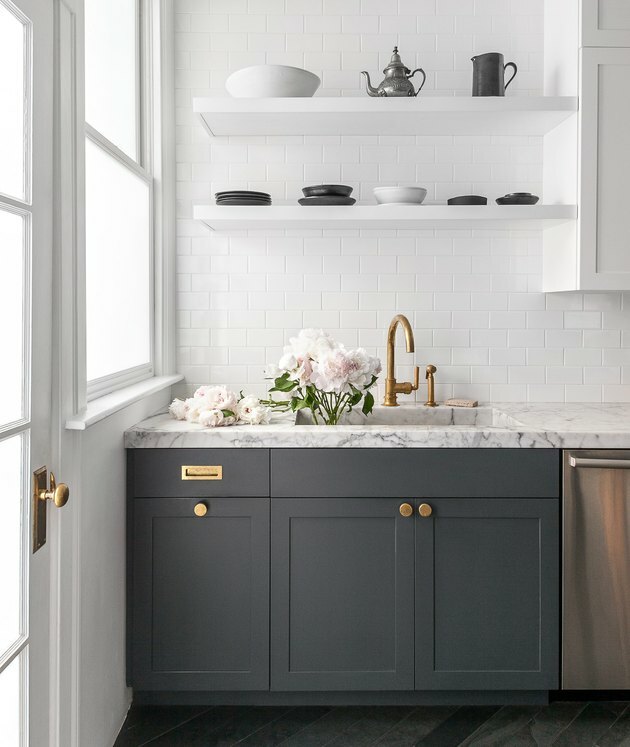 A white subway tile backsplash, brass fixtures, and ceramic dishware are the picture-perfect backdrop for this kitchen designed by Grant Gibson. 13. Dark repurposed wood cabinetry imparts vintage charm. Attention homeowners aching for that vintage feel: Many large antique stores have old, unwanted cabinetry just waiting for their chance at a new life. 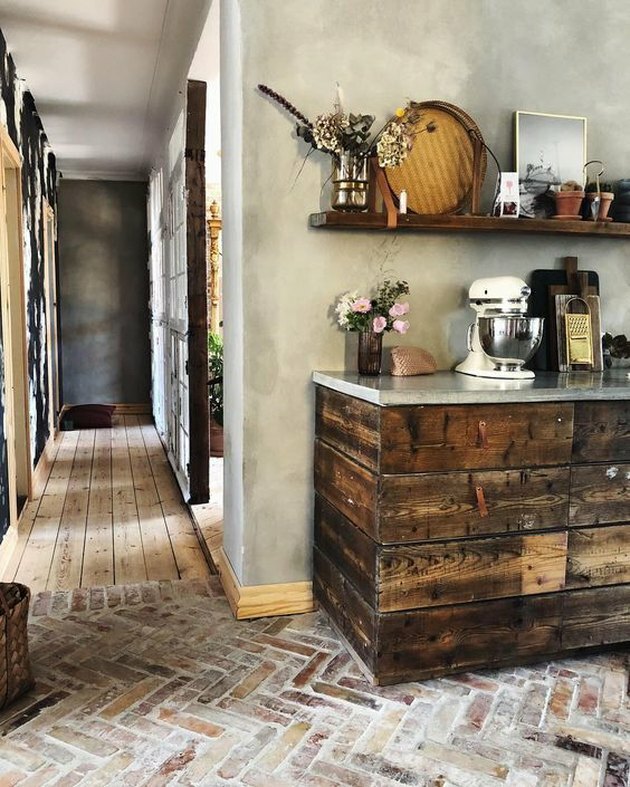 All you have to do is refinish them and update the hardware, and you too can have a chic, rustic cookspace like this Denmark-based beauty.